It sounds pretty odd to say that you should eat during exercise, let alone eat candy during exercise. But it has actually become a rather popular thing to do among the fitness community. Many people claim that candy serves as an ideal intra-workout carbohydrate that assists in boosting energy and performance during a tough lifting session. The reason for this belief is that candy is a simple carbohydrate, which is digested more quickly than complex carbohydrates. That’s exactly why lifters opt to eat whole grains during a workout, especially since carbohydrates are the body’s main source of fuel. Once the body ingests the carbohydrates, they get broken down into glucose molecules and converted to glycogen, which is stored in both the liver and the muscles. The muscles use the glycogen store for energy in order to work successfully. In order for food to be stored as glycogen, it needs to go through two processes, digestion and absorption. 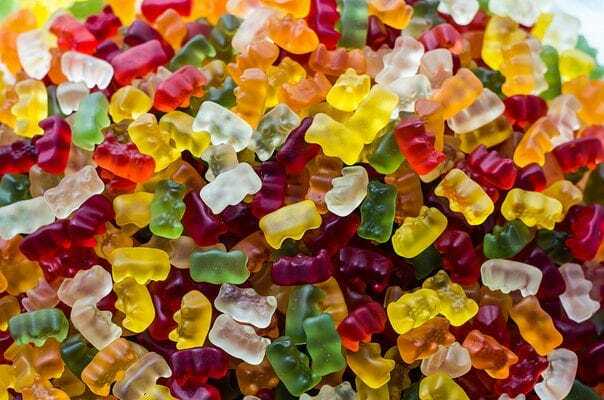 The time it takes to digest food varies, however for something sweet like candy, it ranges from 15 to 45 minutes. Once these sugar molecules are digested, they go through the process of absorption into the circulatory system. In other words, the digested sugar molecules are sent throughout the body and are used. But truth be told, your body simply does not have enough time to digest and absorb the candy during a workout. If you lift for an hour to an hour and a half and eat some candy 20 minutes after you’ve begun, you will not have digested the candy during the remaining time of your workout. So as you long as you have eaten throughout the day, you should be just fine and have enough glycogen stored in your muscles and liver. However, if you are an endurance athlete, then eating carbohydrates during exercise does work, since they train for hours at a time. If you are a marathon runner or triathlete then enjoy candy and sugary snacks like you’re a little kid all over again. Another reason why candy is not as effective as you may have thought is blood flow distribution. The blood takes nutrients throughout your body and is crucial for digestion and absorption. While at rest, muscles take 20% of the blood flow in the body. Which in turn means that around 20% of your blood gets used in your muscles, and the other 80% by your organs. During intense exercise, most of the blood goes to the muscles. And therefore with less blood in the organs, the process of digestion and absorption are slowed down. If you think candy will help you during a workout, then go for it. Maybe it will even have a placebo effect it. Just know that unless you’re an endurance athlete, it’s effect are less than magical.